His original menu, written entirely in French, was vast—nine oyster appetizers, 51 seafood entrees and 40 vegetables (with potatoes prepared 16 different ways). It was indulgent, charming, provocative. Much like Arnaud Leon Cazenave himself. New Orleans quickly took to the Count’s philosophy and the restaurant became a hub of life—from Canal Street businessmen and other locals to the tourists pouring in to New Orleans after World War II. As a result, Count Arnaud kept expanding, kept devouring the buildings around him for more space, creating a labyrinth of secret dining rooms equipped with locked doors and buzzers for service. Discretion came with the meal. Count Arnaud died in 1948, but not before handing the baton off to his daughter Germaine, a wild New Orleanian who loved alcohol, men and celebration almost as much as she loved attention. But all this was second to her love for her father and his legacy. She learned the business inside and out and ran the restaurant for several decades. 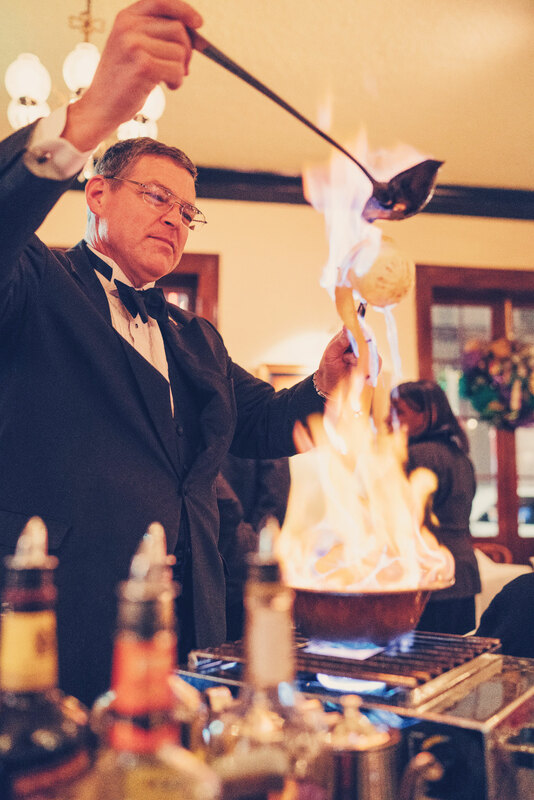 Even now—one hundred years after the first Oysters Bienville bubbled in their sherry and cream sauce or the first Cafe Brulot flamed up with an intoxicating clove and citrus scent—a meal at Arnaud’s is never just a meal. That’s thanks, in part, to the family that came after the Casenaves. Germaine grew older as did the restaurant and its buildings. 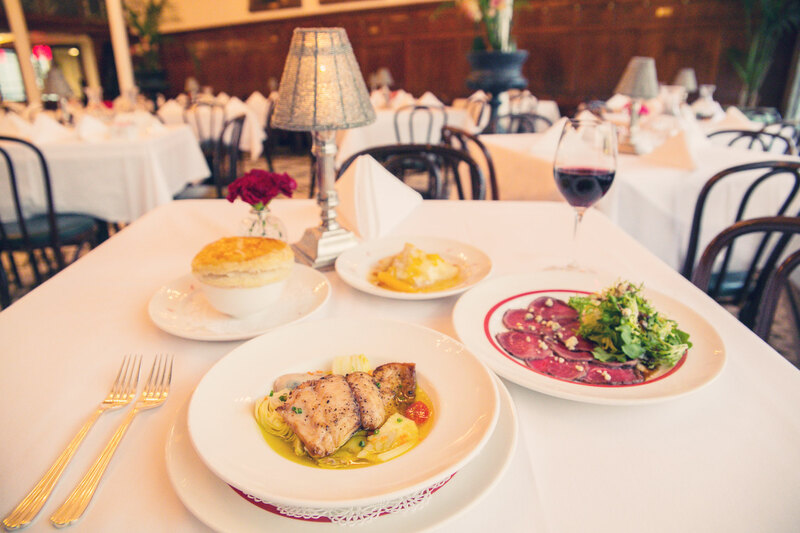 It took a man with the same initials as her father, Archie Casbarian, to convince Germaine to relinquish some control and let him reinvigorate Arnaud’s. When Archie took over the lease in 1978, most of the dining rooms were closed and the buildings were falling apart. Renovations would take millions of dollars. But Archie was a highly skilled hotelier and creative problem solver. Together with his wife, Jane, and two toddlers in tow, they dug in and got to work. When a recession in the early 80s sent interest rates skyrocketing, complicating investments for the renovations, Archie decided to sell tables to customers and companies. For $10,000, you could get a plaque above your table, priority reservations and an open account credit over three years for a private stock of wine and liquors. The community, quite literally, ate it up. Today, the Arnaud’s menu is slightly smaller than the original, offering 23 entrees (in English) instead of 51. But the spirit of a meal being something special drifts along the main dining room’s beveled glass windows just like the live Dixieland jazz during a Sunday brunch. It follows the wait staff who flow between elegantly set tables attending to the needs you didn’t even know you had. Just a warning: the French bread is going to be perfectly crusted, so don’t worry when the crumbs fall to the tablecloth. It’s a sign of perfection and your waiter’s fine-edged crumber will have your place setting snowy white again in no time. French 75, Arnaud’s cozy, dark-hued bar off the dining room, is a favorite of Esquire magazine and won outstanding bar program from the James Beard Foundation in 2017. Here you can sip on the bar’s namesake drink, a classic Sazerac or something a little more exotic like the hibiscus-pineapple tea, rum and cachaca-based Amaryllis Sling. The bar, along with the restaurant, opens nightly at 6 p.m. Make sure you arrive a little earlier for whichever side you’re planning to enjoy—Germaine’s Mardi Gras museum is right upstairs (she reigned as queen over 22 balls). Whether you’ve done the Mardi Gras a million times or never, you’ll catch a glimpse of the characters who brought Arnaud’s to life over the years. It’s high on indulgence and charm. Just like Arnaud’s. 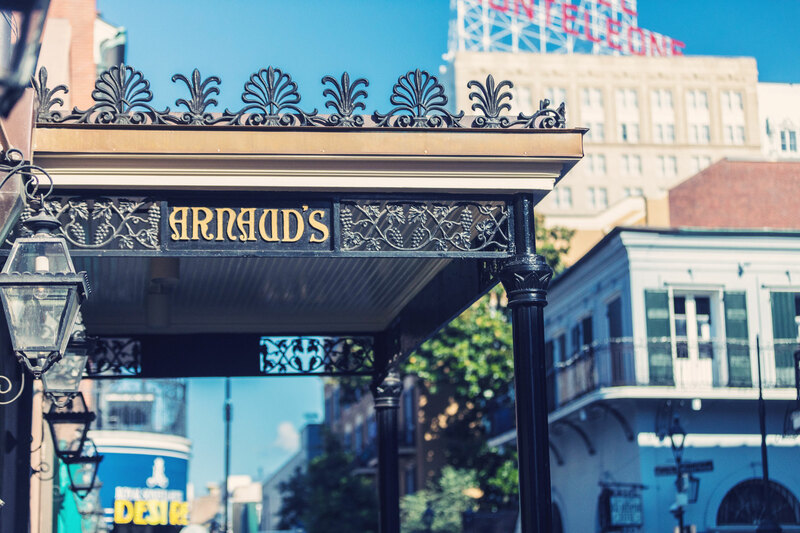 Arnaud’s celebrates their 100th birthday during New Orleans’ Tricentennial. Visit New Orleans, and start your story with #OnetimeinNOLA.